These posters represent the second of two maps commissioned by the Florida Wildlife Corridor Expedition to commemorate the connected sections of the Wildlife Corridor journey. 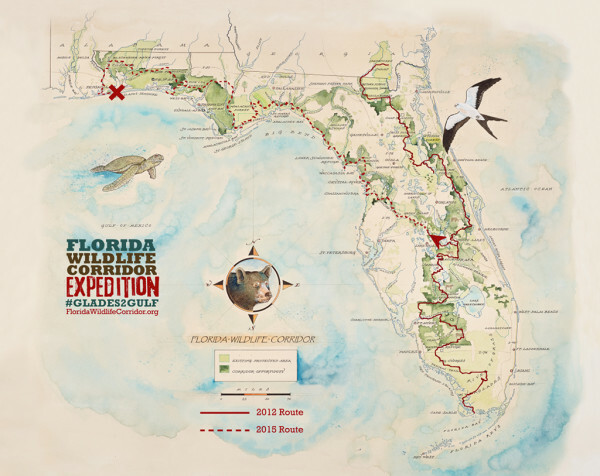 The exquisitely rendered animals, birds and waterways that draw one into following the details of the map, created by renowned watercolor artist Mike Reagan, impart a sense of adventure and discovery very much in keeping with the nature of the Expedition itself. Dimensions 16 x 20 inches.